This time of year is always so much fun, lots of great projects are planned, celebrations and of course sweet treats. Teachers If you are like me you try to throw some super cute, very challenging Pinterest project together to show your students how much you care. Forget all of the fuss and stick with simple. 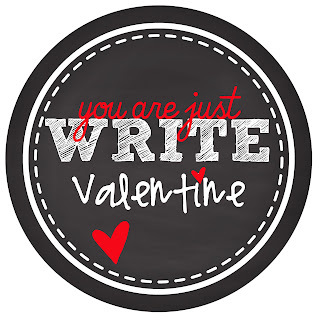 These "You are just WRITE Valentine" cutouts are as easy as they come. Just pick up some colorful pencils from the $1 section at Target and grab your hole puncher. Print out the Tags below, cut out and hole punch the top and bottom. Slide the pencil through and you are all set with a simple yet very useful Valentine for your students. *If you would like to add your own signature you can do this in a word document. Just add a text box, right click on it and select no line, no color. Add white or red text for your signature.